If Spain isn’t on your list of possible retirement destinations, you really should pay it a visit. While it isn’t as cheap as Southeast Asia or parts of Latin America, the cost of living is quite reasonable, and Spain today is a modern, developed country—nothing Third World about it. You might just be pleasantly surprised, as I was. Madrid, with 3.2 million inhabitants, is Spain’s largest city. Barcelona is about half the size of Madrid. Valencia is about half of Barcelona, and Alicante about half of Valencia, with fewer than 350,000 in the city proper. But with each step down in size, I didn’t notice that anything was lost. Rather, the essence of Spain just seemed to become more distilled. 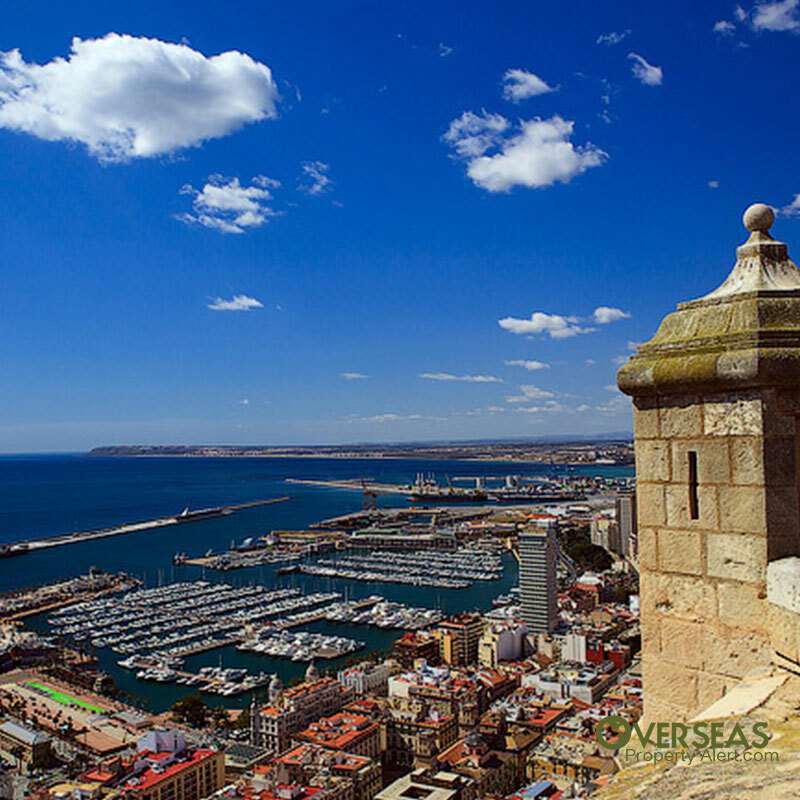 Alicante, also known as Alacant in Valencian, sits on the Costa Blanca of Spain. 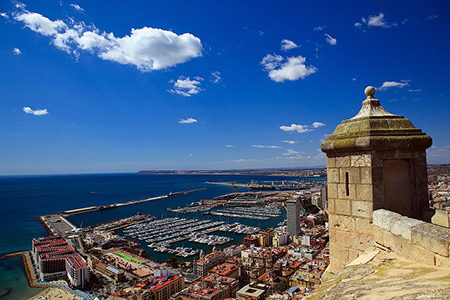 Although its roots are ancient, today Alicante is a modern city, with a bustling centro filled with chic designer shops and department stores, equally chic people, a harbor crowded with envy-arousing yachts, and a sleek tram/light-rail system. chat, and the conversation often is continued over a leisurely cup of coffee. Lovely from any angle, Alicante is perhaps loveliest from above. Parks are sprinkled liberally about, and there is the broad Explanada de España which runs along the exquisite harbor. Alicante looks like a city which was designed to be enjoyed. You’ll find eateries everywhere, with a preponderance in the city center, which is strikingly clean and vibrant, and also, I was told, safe to walk even in the madrugada—the wee hours. In the city center you can also find virtually everything else you might need. You might not need to look any farther than the multistory Corte Inglés department stores—there are two in the downtown area. It’s little wonder that many people choose to live in the centro. But really, you can live anywhere in the city and get where you want to go easily, as the public transit is excellent. Buses (1.50 euros) are modern and air-conditioned, and integrate with the tram system, which comprises five lines, 71 stations, and 78 miles of rail. The tram system (3.75 euros one way, 6.00 round-trip) covers not only the city proper, but extends to outlying areas such as Benidorm, and so is a great way to explore the area. There truly is no need to own a car here. Alicante is easy to fall in love with. However, you will likely have to reset your internal clock to get in sync with the local rhythm. The alicantines have learned that it’s best not to battle the afternoon sun, and still observe the siesta. Most shops open at 9 a.m., close at 2 p.m., reopen at 5 p.m., and then remain open until around 8 p.m. Dinner is taken late by North American standards. Before or after dinner, people enjoy walking along the Explanada de España, which boasts many bars and restaurants. Though the schedule may initially seem odd, if you just relax and give in, you’ll soon find that these folks really are on to something. If you have a boat fetish, Alicante is made for you, as yachts, sailboats, and craft of all sorts moor in its harbor. If you aren’t ready to shell out for your own boat, you can still charter one or take a day tour to nearby islands. And the climate is great for boating—or any type of outdoor activity. Even in winter, daytime highs are usually in the low 60s (Fahrenheit). In the summers, highs often climb to 90, but these days air conditioning is common. There’s a lot to like here, but the food tops my list. I never tire of paella, which comes in so many varieties. And there’s shrimp, and squid, and octopus. If you aren’t a fan of seafood, try the olla churra, which is a hearty meat-and-veggie stew. A custom which I love is that most bars and restaurants give you a tapa—a little snack—free when you order a drink. ¡Una cerveza más, por favor! For breakfast, I suggest you order a media tostada con tomate. It’s basically bruschetta, but oh so fresh and zesty. Give me one, a fresh cup of strong coffee cut with milk, and a view of the Mediterranean, and I’m in heaven. There are currently many properties in and around Alicante for sale and rent. However, Alicante was one of the fastest-growing cities in Spain before the economic crisis, and I’d look for it to be one of the first to rebound. This could be a great time to look for bargains, before a resurgence. I like the downtown, although you might prefer something less central. As long as you are near a bus or tram station, you can quickly get anywhere in town. Right in the heart of Alicante is a 90-square-meter (969-square-foot), three-bedroom, 1.5-bath penthouse apartment with a 30-square-meter patio. The location is excellent, just two minutes walking from the Plaza de Los Luceros, near the esplanade and beach. It offers great views, including the Castle de Santa Barbara. It has air conditioning and heating units and comes partially furnished. Condo fees are a low 31 euros per month and the price was reduced from 219,000 to 199,000 euros. Another well-located apartment, minutes from downtown, comes with the opportunity to generate income. It’s a brand-new, two-bedroom, two-bath, 68-square-meter (732-square-foot) unit in a multistory building. It’s loaded with amenities and is located near both golf and the beach. You have the option of placing the apartment with a professional manager to rent out when you are not using it yourself, potentially generating a nice income. Asking price is 150,000 euros. There are also many lower-price units. One example is a two-bedroom, one-bath apartment, 55 square meters (592 square feet) plus balcony, recently refurbished, for only 65,000 euros. It’s located in a good area beside a tram station and park, with everything you need right nearby. If you would prefer a house, a two-bedroom, one-bath bungalow home is available in the Las Filipinas area, a bit north of downtown adjacent Campoamor. The 70-square-meter (753-square-foot) home is situated on a 223-square-meter (2,400-square-foot) lot, and has a porch and patio. It comes furnished. BONUS: There is also a separate 40-square-meter (431-square-foot), one-bedroom, one-bath apartment (which requires some light renovation). Asking price is 68,900 euros. You could live large in a two-bedroom, one-bath, 50-square-meter (538-square-foot) penthouse apartment, fully furnished, for only 350 euros per month on a long-term lease. The apartment is located in the Los Ángeles-San Agustín area just north of Campoamor. It offers great views from its 20-square-meter (215-square-foot) patio, and is near services and transport. SpainHouses.net offers several two- and three-bedroom furnished apartments for longer-term rent in the 350–375 euros per month range. As one example, a two-bedroom, one-bath, 60-square-meter apartment, located 15 minutes from the beach, near a tram station, is available for just 350 euros per month. There are also several sites which allow you to book shorter-term holiday rentals in Alicante and along the Costa Blanca, although at higher rates. Editor’s Note: We received several letters last week from readers confused by our incorrect conversions. We appreciate you all taking the time to send in the corrections and we apologize for the errors. Please visit last week’s article here for corrected figures. –L.H. First of all is that correct statement? If yes, do we still have to fill up tax forms with Spanish tax office? I know there is a treaty between US and Spain to prevent dual taxation but if the tax rates in Spain are higher than in US there could be possibility Spain may require to pay the difference. Would you know answers to those questions or could you recommend a CPA that could comment on my findings? Melanie A. Sample, a CPA based in Madrid who has done work for Live and Invest Overseas for several years. Sonia Cortés García, of Abdón Pedrajas & Molero, is a lawyer specializing in tax. General attorney services: Antoni (Toni) Lasala Grimalt; barceLAW Abogados (http://www.barcelaw.com/); Diputació, 321, 4º, 1ª; 08009 Barcelona; Tel: (+ 34) 93 439.61.53. Question regarding obtaining a Paraguay passport: under Article 150, it stipulates that “Naturalized Paraguayan nationals may lose their nationality by virtue of a court ruling based on an unqualified absence from the Republic for more than three years…or by voluntary adoption of another nationality.” As a US citizen holder of a US passport, how does one address this matter? I will secure my permanent residence card in Panama soon, and am interested in procuring a Paraguay passport. Every country has different rules regarding naturalization. Countries give naturalization with the expectation that the person wants to continue to live in the country. The three year absence rule in Paraguay is relatively short, but so is their residency requirement for obtaining naturalization. It’s something you should speak with your attorney in Paraguay about if you intend to be out of the country for more than three years. As for the “voluntary adoption of another nationality,” that usually only applies if you’re naturalized in another country after being naturalized in the country in question. In other words, any citizenship you have before being naturalized in Paraguay shouldn’t be an issue regarding your Paraguayan citizenship. It’s only if you then went on to get naturalized in, for example, Panama, that Paraguay would have an issue. Again, you should speak with an immigration attorney in Paraguay to discuss your situation and concerns.